EASTER for most people is a long weekend; for some it is the middle of a week or a fortnight’s holiday with the children, a chance to get out in the garden or further afield, to enjoy the glories of the West Country coast and landscape, hopefully with some fine spring weather. But the tourist honeypots will be full and the main roads will be congested, so where can locals go for a good walk without the crowds? The first thing to do is invest in good maps – we use the Ordnance Survey Explorer series (the orange maps) for research for our Deepest books, and to find places to walk. If you rely on satnav, it will get you to the start of your walk, but you need a good map or guidebook to show you where the walks are. The second thing to remember is that even if the car park, laybys or verges near your chosen walk are busy, most people don’t actually walk more than a couple of hundred yards from the car. When we were children in the New Forest we used to be amazed at the number of cars that drove to Lyndhurst and parked at The Bench, a beauty spot overlooking the heath and the cricket pitch – and the busy A35. So many of them would stay in their cars, often facing the road and barricaded from nature by their newspaper. These are just some suggestions for walks around the region which may be busy but which will reward you with great scenery, possible wildlife viewings, woodland sounds and wildflowers and a chance to shake off the depressions which have settled on so many of us over the past year or more of ever more grim national and international news. We have a lot to love in our beautiful region – just remember, please, take your litter home with you (see this week’s Leader for more on this). Maud Heath’s Causeway – The causeway is a path that dates from the 15th century, crossing the Wiltshire Avon and rising above the floodplain on 64 brick arches (built 1812, largely reconstructed in the 20th century) between Bremhill and Langley Burrell. Maud Heath was a childless widow, who made her living carrying eggs to market at Chippenham. When she died in 1474 she left money to improve and maintain the path along which she had walked, carrying her eggs, to market for most of her life. It’s a relatively short and very easy walk, but the history of this path is fascinating. The Wessex Ridgeway is part of the Ridgeway National Trail. It is a route used since prehistoric times by travellers, drovers, herdsmen and soldiers. The 87 mile trail passes through ancient landscapes, downlands, valleys and woodlands in Oxfordshire, Berkshire and particularly North Wiltshire, crossing internationally important sites such as the Avebury stone circle. 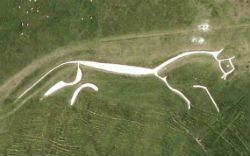 Along the high downs, walkers can see the breathtakingly beautiful and mysterious White Horse at Uffington, and a couple of miles to the west, the equally mysterious Waylands Smithy. 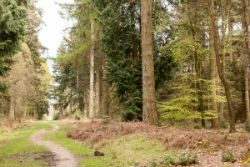 New Forest enclosures – the New Forest is a patchwork of open heath, ancient beech and oak woods and enclosures. There are paths and drives in most of the enclosures and many ancient footways across the heaths. Anywhere in the Forest is fascinating – the trees, the views, the wildlife, the ponies, the dappling streams, the vivid colours of the gorse and the heather, all add up to a place of magic and mystery. And you only have to walk a few hundred yards to have it all to yourself! The Purbeck hills – the isle of Purbeck really feels like another country. Drive or cycle up into the hills beyond Wareham and the world seems to open out before you. 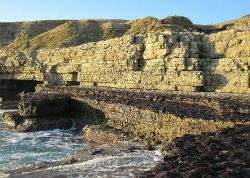 Hike up on to the cliffs above Kimmeridge, out to Dancing Ledge, along the ridge where you can look north across the Bovington tank ranges or south across the Channel, take the coast path from Lulworth Cove .. there are so many walks, some easy, some distinctly challenging. But there are also plenty of good pubs (The Square and Compass at Worth Matravers is deservedly the best known), so you have a welcome pint and good food to reward your efforts. 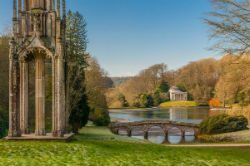 The Stourhead estate – the glittering jewel in the National Trust’s landscaped gardens, Stourhead is the perfect winter or spring walk. Locals love it before it becomes crowded with tourists. You can take a gentle stroll down to the lake side, walk right round the gardens, stopping to admire the temples and follies, and climb up to the Temple of Apollo and look down on the gardens. You can also go to Alfred’s Tower, the landmark in the Stourhead estate woods, and hike through the woods, or make your way down from Peter’s Well, the springhead of the Stour, into the gardens and on to the Spread Eagle Inn in Stourton for a welcome break before the walk back to the Alfred’s Tower car park. 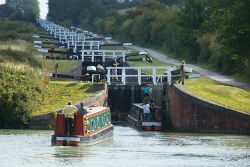 Kennet and Avon canal – any stretch of the paths alongside this engineering wonder is a joy to walk on, but there really is nothing to match the thrill of the 29 locks of the Caen Hill flight near Devizes, or the breathtaking views of the Avoncliff gorge, where the canal crosses the railway, with the river beneath. The canal runs for nearly 90 miles, including a stretch through the city of Bath, where the canal path gives the walker a very unusual view of England’s most beautiful city. You will always meet interesting people, on the paths and on the canals, whatever the weather, whatever the season. The Somerset Levels – one of the most interesting landscape in the region, the Levels cover an area of about 160,000 acres, bisected by the Polden Hills, drained to the south by the River Parrett, and to the north by the Axe and Brue. The area, a magnet for people searching for spiritual renewal, reconnecting with ancient religions or seeking the Arthurian legends, is also a birdlovers’ and wildlife viewers’ paradise.. There are many easy flat walks along the ditches and dikes, hikes up into the hills for the more energetic, and, for all the romantics, there is Glastonbury Tor, a powerful symbol of faith in a landscape that has been exploited and farmed by human beings for many thousands of years. 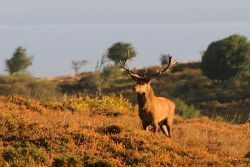 Explore the Quantock Hills – less well-known than the Blackdown Hills on the Devon-Somerset border, or the Mendips between Wells and Bristol, the Quantocks are a tranquil area of deep wooded hills, with heathland, oak woods, ancient parks and stunning views across the Bristol Channel. The Quantock Hills were England’s first Area of Outstanding Natural Beauty. 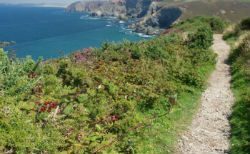 South West Coast path is the longest National Trail in Britain at 630 miles (1014 km). Its start and finish are at Poole and Minehead, so you can start from the relatively gentle Poole Harbour, tackle the Purbeck hills, enjoy the drama of Dorset’s Jurassic coast, follow the glorious Devon coastline, get into the Poldark spirit (but not on horseback, of course – you’re walking, remember) round Cornwall, and then follow the astonishing variety of coastal scenery along north Devon and on to Minehead. Pictures: A raised section of Maud Heath’s Causeway: the mysterious prehistoric Uffington White Horse on the Wessex Ridgeway: a woodland walk in the New Forest: Dancing Ledge on the Purbeck coast: the view across Stourhead from the Bristol Cross to the Pantheon: the Caen Hill Locks near Devizes: the Avalon Marshes with Glastonbury Tor in the distance: a stag on Quantock Hills heathland and a stretch of the South West Coast Path on the north Cornish coast.